I saw a large bird in a tree and stopped to take a photo for IDing later. A woman also stopped to see what I was looking at. I said it was probably a red-tail hawk. She took a look and said that it was a rough-legged hawk (which would have been really cool). I asked how she could ID it so I would know for future. She said that someone had pointed one out to her in the same area a few days earlier so she just knew, and then pointed out it had feathers on the legs. hmmmmm. <insert head-scratch here>. I think it is a red-tail. Taken today south end of Whitby near the lake. Yes, it's a Red-tailed Hawk. No Rough-legged Hawk would have a solid light brown head like that. 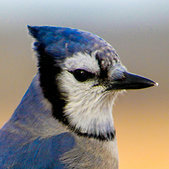 Roughies are also smaller, so they have different proportions than Red-taileds and they have smaller beaks. I sometimes wonder how accurate some sightings are. I saw a Chevy Suburban in a handicapped space at Wal-mart. That doesn't mean every vehicle I'll ever see in that space is a Suburban. That's when I became very suspicious that her info "may" not be exactly accurate.